Trappro bat trappers are experts in trapping bats that have gained access to your attic, walls, house, shed or other areas of your home. Bats will be trapped and removed. Bat droppings and other messes made by bats will be safely removed from walls, attics, sheds etc. Dead bats or baby bats will also be carefully removed if found in your home in Maryland, Washington DC or Northern Virginia. Description: Bats are small, nocturnal, winged mammals. They are the only mammals capable of true long-term flight. Bats tend to be unfamiliar to most people due to their nocturnal habits. They are forced to use echolocation because of their poor eye sight. Bats send an echoing sound in to their surrounding environment, and are able to judge and determine what surrounds them based on the noises that reverberate off of their surroundings. This allows bats to hunt prey and navigate flight in complete darkness. Bats live on every continent in the world with the exception of Antarctica, which is too cold for them. They particularly like tropical and rain forest climates, but they can be found everywhere else as well. Colonies of bats often live in caves because they provide shelter for the bats where they can hang from the ceiling with little risk of harm from predators. Food Sources: Although some species of bats rely on a majority of fruits to survive, bats typically survive by feasting on a number of insects. They fill themselves with a variety of bugs including, but not limited to: moths, mosquitos, beetles, crickets, ladybugs, spiders, and daddy long-legs. Bats will consume water, but minimal amounts are needed due to their small size. Life Span & Reproduction: Breeding for bats occurs between the months of April and May. A female bat, after a period of just 60 days, will give birth to a maximum of 2 bats per litter. Bat mothers still need to fly during pregnancy, which may explain why their litters are so small. Young bats cannot hunt for food on their own until their wingspan has fully developed. Because of this, mother bats nurse their young until they are of adult size and can successfully hunt prey on their own. Most young bats are capable of flight after just 3 or 4 weeks of birth. Bats can live up to 20 years or more, but their population growth is staggered due to low birth rates. BATS ARE FEDERALLY PROTECTED ANIMALS. It is ILLEGAL to harm or kill a bat. They are environmentally essential because of their pollination techniques and seed spreading tactics. Quite a few species of tropical plants rely solely on bats for their seed distribution. Without bats, these seeds would go nowhere and these tropical fruits would no longer exist. The fact that bats also consume a number of insects, regulates our ecosystem and helps to rid the environment of insect pests that would otherwise be in over abundance. 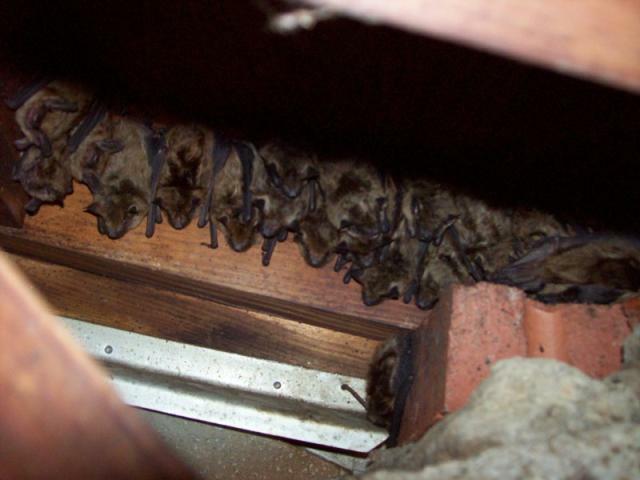 Typical Areas of Entry: Bat infestations typically occur in the attic or attic crawlspace of the home. Bats prefer to be in lofty areas away from ground level. They are able to quickly and easily gain entry because of their size and flying capabilities. They only need a hole the size of a quarter to gain entry. Bats are partial to entering, but are not limited to entry through: open chimney flues, open rooflines, unscreened gable vents, crawlspace vents, roof vents, bath vents, kitchen vents, dryer exhaust vents, rotten fascia or soffits, rotten wood within the roofline, and a number of other potentially open areas within the exterior of a structure. Similar to the hanging shelter with little risk of harm that bats find in the caves of nature, bats find in our human shelters. Colonies of female bats live in the fireplaces, walls, and chimneys of homes where they are safe from most predators and can have babies in groups. Note that if a bat colony exists within your chimney, starting a fire won't help. It will simply allow the damper to become open, allowing the bats easy access inside, and furthermore in to the living space. Bats will begin urinating and defecating in the areas they habituate. Insulation, existing in the attic or crawlspace will become soiled. Quite possibly, an odor is likely to be profound due to the excrement and debris left behind. The "R" value of insulation, which dictates thermal resistance, will become declined over time with debris constantly damaging the insulation. Bat guano (feces) is also EXTRMELY HAZARDOUS MATERIAL. Be sure to NEVER handle bat guano without gloves and proper safety attire. Trained Trappro technicians offers attic insulation/debris removal and reinstallation services to avoid you ever having to take the risk. Typical Treatment: First, a thorough inspection by a Trappro technician will be completed, area(s) of entry will be identified, and repair/sealing recommendations will be established. The technician will explain which areas need to be sealed and the best ways to go about doing so. These repairs should be made in direct conjunction with the installation of an "exclusion trap". Live cage trapping is not effective with bats due to the fact that their bone compilation is mainly cartilage. They can easily escape from cage traps given their small size and flexibility. The fact that bats are federally protected also plays a part. Exclusion traps are one-way doors which allow smaller wildlife (unable to be caught in a live trap) to escape an enclosed area with no allowance for re-entry. In order to assure no re-entry, ALL existing openings will need to be permanently sealed, leaving a small gap for trap installation only, IMMEDIATELY BEFORE the trap is secured. By closing off all existing entry points and installing a fabricated exit, the bats will be limited to one way out with no way back in. Trappro recommends leaving the exclusion trap on the home or structure for approximately 2 to 4 weeks, dependent on climate temperatures and such, in order to assure that all bats have made a successful escape. Once the trap is removed, the trap site is then permanently sealed as the rest of the structure is. Dangers: Bats have a high distribution throughout the world, as well as communal roosting abilities. Colony creation makes bats extremely susceptible to spreading and contracting disease/viruses. Bats are large contractors of rabies, severe acute respiratory syndrome (a viral disease with flu like symptoms that has no cure/treatment), and also henipavirus (a virus that, if transmitted, causes death in both humans and domestic animals). Trappro technicians are properly vaccinated for reasons like these. During Bat Season: Bats love to roost in attics of homes, in sheds & barns *We safely remove bats and bat droppings and clean up the mess & can provide screens and caps to prevent bats from reentering your home through vents. If you hear noises in the attic or in your vents make sure to call us today! Our professional trappers will also be able to seal up holes in attic or walls including fireplaces and vents where bats have entered the home. Trapping and exclusion of bats is available for homeowners and business owners throughout Maryland, Washington DC and Northern Virginia. Call Trappro TODAY! Have your bat intrusion on the road to resolution!